Emma Rose is a health, lifestyle, beauty and fashion blogger based in Sydney, Australia. She is also the co-owner of BuyMyClothes.com, an online marketplace where you can buy, sell and trade new and pre-loved fashion. Optimistic, vibrant and full of life nature, Emma Rose has long had big dreams and a passion for fitness, adventure and travel. 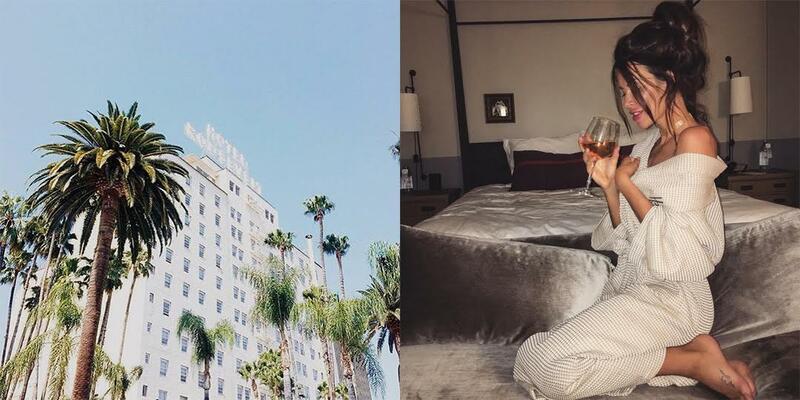 We caught up with her during her recent stay at The Tower at The Hollywood Roosevelt to find out what motivates her and what she wouldn’t dare to travel without. I’m a blogger, influencer and entrepreneur. I own an online marketplace called BuyMyClothes.com, where you can buy, sell and trade new and pre-loved fashion and accessories. I also do part time social media consulting. Top three essential items you pack when travelling? A bikini of course (providing it’s warm), face mask for the plane as my skin always breaks out on long flights and Milo from Australia, I’m addicted, cant go without it. First thing you pick from the hotel mini-bar? Always something sweet! Haha unless they have amazing nuts, cashews always win. Most definitely eating and wine. I love trying the yummiest thing on the menu matched with a glass of red or white. Food 100%. Most definitely the pool and giant blow up unicorn. The pool is iconic, I love it! The unicorn just makes for a fun Instagram photo. A bikini of course, a small one at that for tan lines. Big sunnies and a hat! What on the soundtrack for your stay? I’m loving The Weeknd and Jeremih at the moment. Practically on repeat. What has living in Sydney taught you? Sydney has taught me to be motivated, especially enough to start my own business. Sydney is full of motivated young people driven by each other. Sydney has also taught me, that as much as I love travelling and seeing new places, cultures etc., I honestly think it is such a beautiful place to live. Sydney has taught me to always love coming home. What does LA have that no other city has? I love the style of the buildings, I love that there are palm trees everywhere! The sunsets whilst driving, there’s always something on and I love hiking Runyon! Too much? Haha. My goals and the success of others. I love achieving my goals and setting new ones and constantly testing myself. I get my motivation from others who I look up to. Always be yourself, don’t take life too seriously and be grateful. There’s always someone else in a worse position, no matter how horrible you feel at the time. This life we live is what we make it.